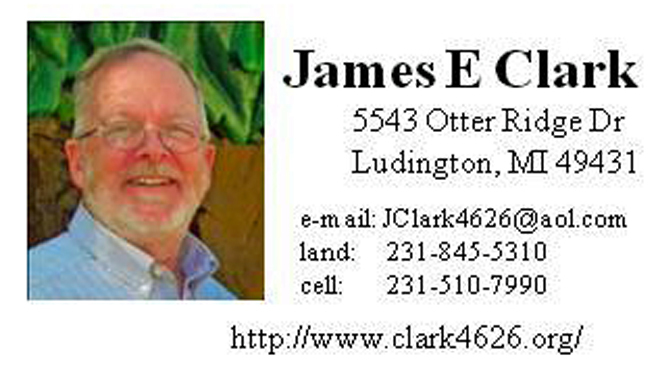 James E. Clark is retired in 1999 from being a Chemical Engineer and licensed Professional Engineer. He now lives on Hamlin Lake. Jim had seven major careers during 35 years of employment at Dow Chemical, 10 years of which were at the Ludington site. The last career at Dow was as a Process Engineer preparing Air and Water Permits, designing processes to treat waste-water, scrub flue-gas from a dioxin incinerator, and stripping contaminated water at a Superfund site. The loves of his life include his wife, Jane; two married children, and three grand-children. He has hobbies of woodworking, small-boat sailing, genealogy, and photography. Jane and he take every opportunity to travel - including mission trips. He keeps web sites for the non-profits of AFFEW, Hamlin Lake Preservation Society, Walleye Association, and Partridge Pointe Association. In addition he maintains the contact-list for AFFEW and the HLPS.